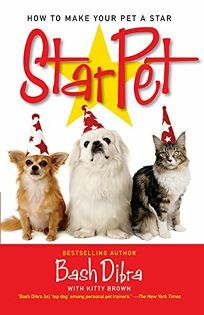 Celebrity pet trainer and animal acting coach Dibra, who has trained the pets of everyone from Henry Kissinger to Calvin Klein, reveals the history behind his successful StarPet business and explains how to prepare pets for the stage and screen in this enjoyable guide. Much of Dibra's advice stems from his extensive knowledge of wolf behavior and his experiences with his own beloved wolf, Mariah, who has starred in a TV movie and served as the official mascot and goodwill ambassador for the 1984 Winter Olympics. In addition to detailed instructions on teaching dogs how to sit, wave, kiss or open doors, Dibra's book includes methods for training a more fastidious pet-the cat. The key to training any pet, he writes, lies in understanding the animal's ""inner drives."" Thus, even felines like Morris from the 9 Lives Cat Food commercials can become great actors. Dibra includes useful tips on guiding your pet through play-acting sequences and lists various events that may prove helpful in ""Getting Your Paw in the Door."" Though he uses exclamation points profusely (""Always keep the play in play-acting!"") and his enthusiasm can be wearying, those looking to teach their pet difficult acting skills like sneezing on cue will find this book both informative and encouraging.